Studies have shown that creative visualisation improves athletes’ performance. Likewise, in self-defence, visualising the moves will prepare you for a real fight and increase your self-confidence. Krav Maga is the self-defence method that was developed by the Israeli army. It enables you to overcome an attacker and neutralise violence in a matter of seconds. It isn’t a traditional martial art because its sole purpose is self-defence, not the practice of a tradition. 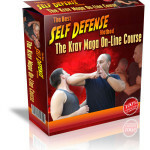 The Krav Maga On-Line Course consists of video movies, mp3 files and an e-book. Each video begins with a slide describing the moves. Each video comes both in regular and slow motion, with vocal explanation in the background that explains what you should do – making it easy to learn. The e-book gives step-by-step explanations, accompanied by pictures that beautifully capture and demonstrate each and every move. The e-book, and its pictures, are a step-by-step guide to the exact moves that appear in the video movies. Mp3 files provide the vocal explanation for each. You can listen to the them while reading the e-book – or whilst driving in your car. Together, these three media types cover a range of of self-learning techniques that make it easy to learn and visualise the Krav Maga moves. The course is divided into six phases. In phases one and two you will learn special techniques to strike with your hands and deliver kicks – foundational skills for effective self-defence. In phase three you will learn to defend against hand strikes. In phase four you will learn to defend against releases. In phase five you will learn to defend against a stick. In phase six you will learn to defend against a knife. In phase seven you will learn to defend against kicks. All the defences incorporate counter-attacks . This on-line course is relatively inexpensive, even more so when you consider the huge value you will get in return. Some links will take you to recommended products. We only recommend products that we have either personally checked out ourselves or that come from people we know and trust. For doing so we may receive compensation. Results are unique. Your results will vary.